A very strong low pressure system in the upper atmosphere looks like it could trigger violent, long-track tornadoes tomorrow. 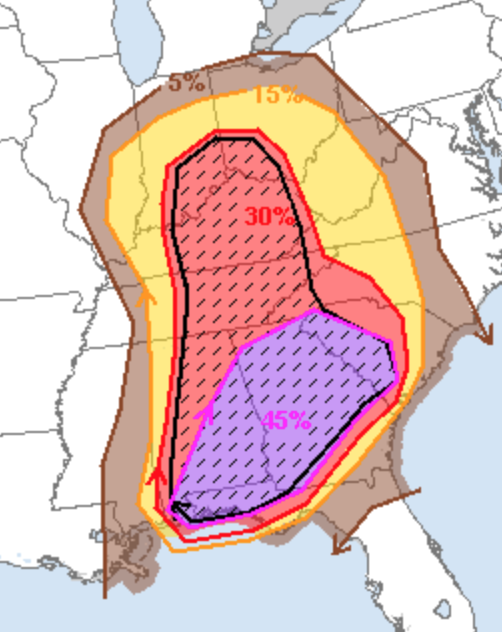 If you live in the 15% or higher probability area, please pay attention to tomorrow's weather at the first sign of thunderstorms approaching. 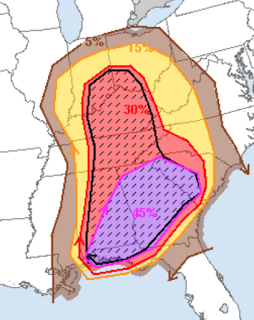 The hatched area may have strong tornadoes. Here is what you should do to prepare. Make sure you have at least two, independent, sources for tornado warnings. I recommend the AccuWeather smartphone app and WeatherCall. They will give you the warnings for your home (or other selected location) with a few false alarms as possible. The red link will get you a free test for tomorrow. Have a system for your children and infirm friends and relatives to get the warning quickly and get to shelter in seconds. If infirm people need help getting sheltered, go pick them up before thunderstorms approach. Do NOT try to get to them after a tornado warning is issued. Make sure your phone and laptop are fully charged. Won't hurt to make sure you have some extra cast and a full fuel tank for your car. Make sure your generator is full of fuel and working properly. Reminder: I provide periodic real-time storm information -- based on good science and without hype -- on Twitter @usweatherexpert .